What are other names for congenital heart defects? What are the signs and symptoms and signs of congenital heart defects? How are congential heart defects diagnosed?? Congenital heart defects are the most common type of birth defect, affecting 8 out of every 1,000 newborns. Each year, more than 35,000 babies in the United States are born with congenital heart defects. There are many types of congenital heart defects ranging from simple to very complex. Doctors don't know what causes most congenital heart defects. Heredity may play a role. A bluish tint to skin, lips, and fingernails. This is called cyanosis. Serious heart defects are usually diagnosed while a baby is still in the womb or soon after birth. Some defects aren't diagnosed until later in childhood, or even in adulthood. An echocardiogram is an important test for both diagnosing a heart problem and following the problem over time. This test helps diagnose problems with how the heart is formed and how well it's working. Other tests include EKG (electrocardiogram), chest x ray, pulse oximetry, and cardiac catheterization. Doctors treat congenital heart defects with catheter procedures and surgery. Treatment depends on the type and severity of the defect. With new advances in testing and treatment, most children with congenital heart defects grow into adulthood and can live healthy, productive lives. Some need special care all though their lives to maintain a good quality of life. When I heard about Ryan Marquiss and saw his smiling 3 year old toddler face I was pretty much amazed, but pleased. Ectopia cordis is an exceedingly rare defect in which the heart, in part or in its entirety, forms outside the chest cavity. It is considered as one of the less common cardiac malpositions (defects characterized by the heart or great vessels developing in the wrong place). When I say rare, I mean rare. Ectopia cordis occurs in 5 to 7 per one million live births and is associated with an extremely high mortality rate. Congenital heart defects change the normal flow of blood through the heart. There are many types of congenital heart defects. They range from simple defects with no symptoms to complex defects with severe, life-threatening symptoms. Congenital heart defects are the most common type of birth defect. They affect 8 out of every 1,000 newborns. Each year, more than 35,000 babies in the United States are born with congenital heart defects. Many of these defects are simple conditions. They need no treatment or are easily fixed. Some babies are born with complex congenital heart defects. These defects require special medical care soon after birth. The diagnosis and treatment of complex heart defects has greatly improved over the past few decades. As a result, almost all children who have complex heart defects survive to adulthood and can live active, productive lives. Most people who have complex heart defects continue to need special heart care throughout their lives. They may need to pay special attention to how their condition affects issues such as health insurance, employment, birth control and pregnancy, and other health issues. In the United States, more than 1 million adults are living with congenital heart defects. To understand congenital heart defects, it's helpful to know how a healthy heart works. Your child's heart is a muscle about the size of his or her fist. The heart works like a pump and beats 100,000 times a day. The heart has two sides, separated by an inner wall called the septum. The right side of the heart pumps blood to the lungs to pick up oxygen. The left side of the heart receives the oxygen-rich blood from the lungs and pumps it to the body. 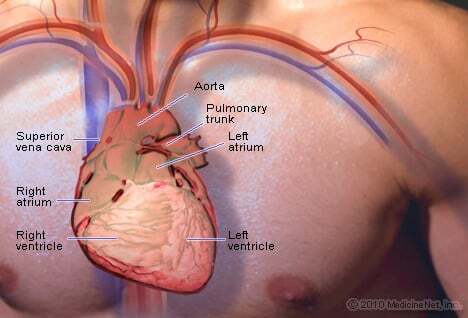 The heart has four chambers and four valves and is connected to various blood vessels. Veins are blood vessels that carry blood from the body to the heart. Arteries are blood vessels that carry blood away from the heart to the body. Picture of a healthy heart cross-section. The atria (AY-tree-uh) are the two upper chambers that collect blood as it flows into the heart. The pulmonary (PULL-mun-ary) valve is in the right side of the heart, between the right ventricle and the entrance to the pulmonary artery. This artery carries blood from the heart to the lungs. The aortic (ay-OR-tik) valve is in the left side of the heart, between the left ventricle and the entrance to the aorta. This artery carries blood from the heart to the body. Valves are like doors that open and close. They open to allow blood to flow through to the next chamber or to one of the arteries. Then they shut to keep blood from flowing backward. The first sound -- the "lub" -- is made by the mitral and tricuspid valves closing at the beginning of systole (SIS-toe-lee). Systole is when the ventricles contract, or squeeze, and pump blood out of the heart. The second sound -- the "DUB" -- is made by the aortic and pulmonary valves closing at the beginning of diastole (di-AS-toe-lee). Diastole is when the ventricles relax and fill with blood pumped into them by the atria. The pulmonary artery carries blood from the right side of the heart to the lungs to pick up a fresh supply of oxygen. The aorta is the main artery that carries oxygen-rich blood from the left side of the heart to the body. The pulmonary veins carry oxygen-rich blood from the lungs to the left side of the heart so it can be pumped to the body. With congenital heart defects, some part of the heart doesn't form properly before birth. This changes the normal flow of blood through the heart. There are many types of congenital heart defects. Some are simple, such as a hole in the septum. The hole allows blood from the left and right sides of the heart to mix. Another example of a simple defect is a narrowed valve that blocks blood flow to the lungs or other parts of the body. Other heart defects are more complex. They include combinations of simple defects, problems with the location of blood vessels leading to and from the heart, and more serious problems with how the heart develops. The septum is the wall that separates the chambers on left and right sides of the heart. The wall prevents blood from mixing between the two sides of the heart. Some babies are born with holes in the septum. These holes allow blood to mix between the two sides of the heart. Atrial septal defect (ASD). An ASD is a hole in the part of the septum that separates the atria—the upper chambers of the heart. The hole allows oxygen-rich blood from the left atrium to flow into the right atrium, instead of flowing into the left ventricle as it should. Many children who have ASDs have few, if any, symptoms. Picture of a cross-section of a normal heart and a heart with an atrial septal defect. Figure A shows the structure and blood flow inside a normal heart. Figure B shows a heart with an atrial septal defect. The hole allows oxygen-rich blood from the left atrium to mix with oxygen-poor blood from the right atrium. ASDs can be small, medium, or large. Small ASDs allow only a little blood to leak from one atrium to the other. They don't affect how the heart works and don't need any special treatment. Many small ASDs close on their own as the heart grows during childhood. Medium and large ASDs allow more blood to leak from one atrium to the other. They're less likely to close on their own. About half of all ASDs close on their own over time. Medium and large ASDs that need treatment can be repaired using a catheter procedure or open-heart surgery. Ventricular septal defect (VSD). A VSD is a hole in the part of the septum that separates the ventricles—the lower chambers of the heart. The hole allows oxygen-rich blood to flow from the left ventricle into the right ventricle, instead of flowing into the aorta and out to the body as it should. Picture of a cross-section of a normal heart and a heart with a ventricular septal defect. Figure A shows the structure and blood flow inside a normal heart. 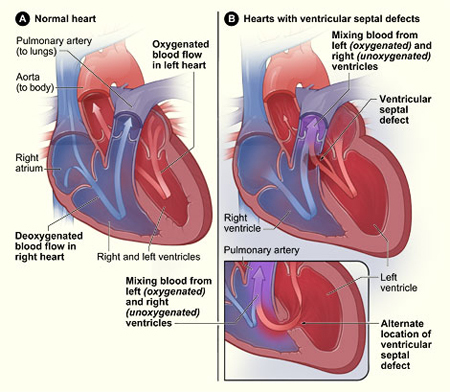 Figure B shows two common locations for a ventricular septal defect. 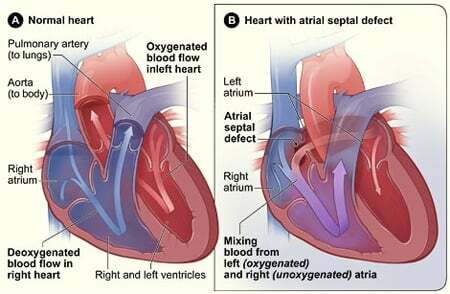 The defect allows oxygen-rich blood from the left ventricle to mix with oxygen-poor blood in the right ventricle. VSDs can be small, medium, or large. Small VSDs don't cause problems and may close on their own. Medium VSDs are less likely to close on their own and may require treatment. Large VSDs allow a lot of blood to flow from the left ventricle to the right ventricle. As a result, the left side of the heart must work harder than normal. Extra blood flow increases blood pressure in the right side of the heart and the lungs. 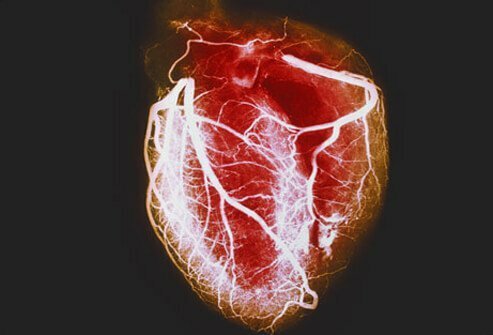 The heart's extra workload can cause heart failure and poor growth. If the hole isn't closed, high blood pressure can scar the arteries in the lungs. Doctors use open-heart surgery to repair VSDs. Patent ductus arteriosus (PDA) is a fairly common heart defect that can occur soon after birth. In PDA, abnormal blood flow occurs between the aorta and the pulmonary artery. Before birth, these arteries are connected by a blood vessel called the ductus arteriosus. This blood vessel is an essential part of fetal blood circulation. Within minutes or up to a few days after birth, the ductus arteriosus closes. In some babies, however, the ductus arteriosus remains open (patent). The opening allows oxygen-rich blood from the aorta to mix with oxygen-poor blood from the pulmonary artery. This can strain the heart and increase blood pressure in the lung arteries. A heart murmur might be the only sign of PDA. (A heart murmur is an extra or unusual sound heard during a heartbeat.) Other signs and symptoms can include shortness of breath, poor feeding and growth, tiring easily, and sweating with exertion. PDA is treated with medicines, catheter-based procedures, and surgery. Small PDAs often close without treatment. Simple congenital heart defects also can involve the heart's valves. These valves control the flow of blood from the atria to the ventricles and from the ventricles into the two large arteries connected to the heart (the aorta and the pulmonary artery). Stenosis (steh-NO-sis). This defect occurs if the flaps of a valve thicken, stiffen, or fuse together. As a result, the valve cannot fully open. Thus, the heart has to work harder to pump blood through the valve. Atresia (ah-TRE-ze-AH). This defect occurs if a valve doesn't form correctly and lacks a hole for blood to pass through. Atresia of a valve generally results in more complex congenital heart disease. Regurgitation (re-GUR-jih-TA-shun). This defect occurs if a valve doesn't close tightly. As a result, blood leaks back through the valve. The most common valve defect is pulmonary valve stenosis, which is a narrowing of the pulmonary valve. This valve allows blood to flow from the right ventricle into the pulmonary artery. The blood then travels to the lungs to pick up oxygen. Pulmonary valve stenosis can range from mild to severe. Most children who have this defect have no signs or symptoms other than a heart murmur. Treatment isn't needed if the stenosis is mild. In babies who have severe pulmonary valve stenosis, the right ventricle can get very overworked trying to pump blood to the pulmonary artery. These infants may have signs and symptoms such as rapid or heavy breathing, fatigue (tiredness), and poor feeding. Older children who have severe pulmonary valve stenosis may have symptoms such as fatigue while exercising. Some babies may have pulmonary valve stenosis and PDA or ASDs. If this happens, oxygen-poor blood can flow from the right side of the heart to the left side. This can cause cyanosis (si-ah-NO-sis). Cyanosis is a bluish tint to the skin, lips, and fingernails. It occurs because the oxygen level in the blood leaving the heart is below normal. Severe pulmonary valve stenosis is treated with a catheter procedure. Complex congenital heart defects need to be repaired with surgery. Advances in treatment now allow doctors to successfully repair even very complex congenital heart defects. An overriding aorta. In this defect, the aorta is located between the left and right ventricles, directly over the VSD. As a result, oxygen-poor blood from the right ventricle can flow directly into the aorta instead of into the pulmonary artery. Right ventricular hypertrophy (hi-PER-tro-fe). In this defect, the muscle of the right ventricle is thicker than usual because it has to work harder than normal. In tetralogy of Fallot, not enough blood is able to reach the lungs to get oxygen, and oxygen-poor blood flows to the body. Picture of a cross-section of a normal heart and a heart with tetralogy of Fallot. Figure A shows the structure and blood flow inside a normal heart. Figure B shows a heart with the four defects of tetralogy of Fallot. Babies and children who have tetralogy of Fallot have episodes of cyanosis, which can be severe. In the past, when this condition wasn't treated in infancy, older children would get very tired during exercise and might faint. Tetralogy of Fallot is repaired in infancy now to prevent these problems. 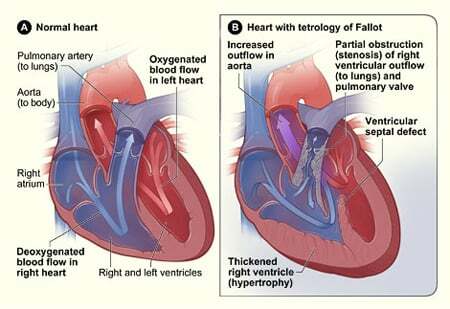 Tetralogy of Fallot must be repaired with open-heart surgery, either soon after birth or later in infancy. The timing of the surgery will depend on how narrow the pulmonary artery is. Children who have had this heart defect repaired need lifelong medical care from a specialist to make sure they stay as healthy as possible. If your child has a congenital heart defect, you may think you did something wrong during your pregnancy to cause the problem. However, doctors often don't know why congenital heart defects occur. Heredity may play a role in some heart defects. For example, a parent who has a congenital heart defect may be more likely than other people to have a child with the defect. Rarely, more than one child in a family is born with a heart defect. Children who have genetic disorders, such as Down syndrome, often have congenital heart defects. In fact, half of all babies who have Down syndrome have congenital heart defects. Researchers continue to search for the causes of congenital heart defects. Many congenital heart defects cause few or no signs and symptoms. A doctor may not even detect signs of a heart defect during a physical exam. Congenital heart defects don't cause chest pain or other painful symptoms. Heart defects can cause heart murmurs (extra or unusual sounds heard during a heartbeat). Doctors can hear heart murmurs using a stethoscope. However, not all murmurs are signs of congenital heart defects. Many healthy children have heart murmurs. Normal growth and development depend on a normal workload for the heart and normal flow of oxygen-rich blood to all parts of the body. Babies who have congenital heart defects may have cyanosis and tire easily while feeding. As a result, they may not gain weight or grow as they should. Older children who have congenital heart defects may get tired easily or short of breath during physical activity. Severe congenital heart defects generally are diagnosed during pregnancy or soon after birth. Less severe defects often aren't diagnosed until children are older. Minor defects often have no signs or symptoms. Doctors may diagnose them based on results from a physical exam and tests done for another reason. Pediatric cardiologists are doctors who specialize in the care of babies and children who have heart problems. Cardiac surgeons are specialists who repair heart defects using surgery. Echo is an important test for both diagnosing a heart problem and following the problem over time. The test can show problems with the heart's structure and how the heart is reacting to those problems. Echo will help your child's cardiologist decide if and when treatment is needed. During pregnancy, if your doctor suspects that your baby has a congenital heart defect, fetal echo can be done. This test uses sound waves to create a picture of the baby's heart while the baby is still in the womb. Fetal echo usually is done at about 18 to 22 weeks of pregnancy. If your child is diagnosed with a congenital heart defect before birth, your doctor can plan treatment before the baby is born. An EKG is a simple, painless test that records the heart's electrical activity. The test shows how fast the heart is beating and its rhythm (steady or irregular). An EKG also records the strength and timing of electrical signals as they pass through the heart. An EKG can detect if one of the heart's chambers is enlarged, which can help diagnose a heart problem. A chest X-ray is a painless test that creates pictures of the structures in the chest, such as the heart and lungs. This test can show whether the heart is enlarged. It also can show whether the lungs have extra blood flow or extra fluid, a sign of heart failure. For this test, a small sensor is attached to a finger or toe (like an adhesive bandage). The sensor gives an estimate of how much oxygen is in the blood. During cardiac catheterization (KATH-e-ter-ih-ZA-shun), a thin, flexible tube called a catheter is put into a vein in the arm, groin (upper thigh), or neck. The tube is threaded to the heart. Special dye is injected through the catheter into a blood vessel or one of the heart's chambers. The dye allows the doctor to see blood flowing through the heart and blood vessels on an x-ray image. The doctor also can use cardiac catheterization to measure the pressure and oxygen level inside the heart chambers and blood vessels. This can help the doctor figure out whether blood is mixing between the two sides of the heart. Cardiac catheterization also is used to repair some heart defects. Although many children who have congenital heart defects don't need treatment, some do. Doctors repair congenital heart defects with catheter procedures or surgery. Sometimes doctors combine catheter and surgical procedures to repair complex heart defects, which may involve several kinds of defects. The treatment your child receives depends on the type and severity of his or her heart defect. Other factors include your child's age, size, and general health. Some children who have complex congenital heart defects may need several catheter or surgical procedures over a period of years, or they may need to take medicines for years. Catheter procedures are much easier on patients than surgery. They involve only a needle puncture in the skin where the catheter (thin, flexible tube) is inserted into a vein or an artery. Doctors don't have to surgically open the chest or operate directly on the heart to repair the defect(s). This means that recovery may be easier and quicker. The use of catheter procedures has increased a lot in the past 20 years. They have become the preferred way to repair many simple heart defects, such as atrial septal defect (ASD) and pulmonary valve stenosis. For ASD repair, the doctor inserts a catheter into a vein in the groin (upper thigh). He or she threads the tube to the heart's septum. A device made up of two small disks or an umbrella-like device is attached to the catheter. When the catheter reaches the septum, the device is pushed out of the catheter. The device is placed so that it plugs the hole between the atria. It's secured in place and the catheter is withdrawn from the body. Within 6 months, normal tissue grows in and over the device. The closure device does not need to be replaced as the child grows. For pulmonary valve stenosis, the doctor inserts a catheter into a vein and threads it to the heart's pulmonary valve. A tiny balloon at the end of the catheter is quickly inflated to push apart the leaflets, or "doors," of the valve. Then, the balloon is deflated and the catheter and ballon are withdrawn. This procedure can be used to repair any narrowed valve in the heart. To help guide the catheter, doctors often use echocardiography (echo), transesophageal (tranz-ih-sof-uh-JEE-ul) echo (TEE), and coronary angiography (an-jee-OG-rah-fee). TEE is a special type of echo that takes pictures of the heart through the esophagus. The esophagus is the passage leading from the mouth to the stomach. Doctors also use TEE to examine complex heart defects. A child may need open-heart surgery if his or her heart defect can't be fixed using a catheter procedure. Sometimes one surgery can repair the defect completely. If that's not possible, the child may need more surgeries over months or years to fix the problem. Rarely, babies are born with multiple defects that are too complex to repair. These babies may need heart transplants. In this procedure, the child's heart is replaced with a healthy heart from a deceased child. The heart has been donated by the deceased child's family. The outlook for children who have congenital heart defects is much better today than in the past. Advances in testing and treatment allow most of these children to survive to adulthood. They're able to live active, productive lives. Many of these children need only occasional checkups with a cardiologist (heart specialist) as they grow up and go through adult life. Children who have complex heart defects need long-term care from trained specialists. This will help them stay as healthy as possible and maintain a good quality of life. Children who have severe heart defects may be at slightly increased risk for infective endocarditis (IE). IE is a serious infection of the inner lining of the heart chambers and valves. Your child's doctor or dentist may give your child antibiotics before some medical or dental procedures (such as surgery or dental cleanings) that can allow bacteria into the bloodstream. Your child's doctor will tell you whether your child needs antibiotics before such procedures. As children who have heart defects grow up and become teens, they should learn how their hearts differ from normal hearts. They also should know what kind of defect they have, how it was treated, and what kind of care is still needed. They should be able to recognize signs and symptoms and know how to respond. Review your current health insurance plan so you understand your coverage. Keeping your health insurance current is important. If you plan to change jobs, find out whether your new health insurance will cover care for your child's congenital heart defect. Some babies and children who have congenital heart defects don't grow and develop as fast as other children. If your child's heart has to pump harder than normal because of a heart defect, he or she may tire quickly while feeding. As a result, your child may not be able to eat enough. Poor feeding may cause your child to be smaller and thinner than other children. Your child also may start certain activities -- such as rolling over, sitting, and walking -- later than other children. After treatments and surgery, growth and development often improve. To help your baby get enough calories, ask his or her doctor about the best feeding schedule. Also, ask whether your baby needs any nutritional supplements. Make sure your child has nutritious meals and snacks as he or she grows. This will help with growth and development. Physical activity helps children strengthen their muscles and stay healthy. Ask your child's doctor how much and what kinds of physical activity are best for your child. Some children and teens who have congenital heart defects may need to limit the amount or type of activity they do. Remember to ask the doctor for a note that describes any limits on your child's physical activities. Schools and other groups may need this information. Children and teens who have serious conditions or illnesses may have emotional issues. For example, they may feel isolated if they have to be in the hospital a lot. Some may feel sad or frustrated with their body image and their inability to be a "normal" kid. Sometimes brothers or sisters are jealous of a child who needs a lot of attention for medical problems. If you have concerns about your child's emotional health, talk with his or her doctor. The move from pediatric care to adult care is an important step in treatment. Talk with your teen's health care team about creating a plan to help your teen transition to adult care. Start planning as soon as your teen is able and willing to fully take part in this process. A transition plan also can help your teen think about other important issues, such as future education and employment, birth control and pregnancy planning, and making healthy choices about nutrition, physical activity, and other lifestyle habits. Adults who needed regular medical checkups for congenital heart defects in their youth may need to keep seeing specialists into adulthood. These adults should pay attention to the following issues. Some people think that the surgery they had in childhood for their congenital heart defects was a cure. They don't realize they may need regular medical followup in adulthood to maintain good health. Some adults may not know what kind of heart defect they had (or still have) or how it was repaired. They should learn about their medical history and know as much as possible about any medicines they're taking. People who have congenital heart defects may need antibiotics before some medical or dental procedures that can allow bacteria to enter the bloodstream. These bacteria can cause infective endocarditis (IE). IE is a serious infection of the inner lining of the heart chambers and valves. Your doctor will tell you whether you need to take antibiotics before medical or dental procedures. Regular brushing, flossing, and visits to the dentist also can help prevent IE. Women who have heart defects should talk with their doctors about the safest type of birth control for them. Many of these women can safely use most methods. However, some women should avoid certain types of birth control, such as birth control pills or intrauterine devices (IUDs). Many women who have simple heart defects can have normal pregnancies and deliveries. Women with congenital heart defects who want to become pregnant (or who are pregnant) should talk with their doctors about the health risks. They also should consult with doctors who specialize in treating pregnant women who have congenital heart defects. Women who have congenital heart defects may be at higher risk than other women of having babies who have congenital heart defects. Pregnant women who have congenital heart defects should talk with their doctors about whether to have fetal echocardiography (echo). This test uses sound waves to create images of the baby's heart. Fetal echo gives the doctor information about the size and shape of the baby's heart. This test also shows how well the heart's chambers and valves are working. Adults who have congenital heart defects should carefully consider how changing jobs will affect their health insurance coverage. Some health plans have waiting periods or clauses to exclude some kinds of coverage. Before making any job changes, find out whether the change will affect your insurance coverage. Several laws protect the employment rights of people who have health conditions, such as congenital heart defects. The Americans with Disabilities Act and the Work Incentives Improvement Act try to ensure fairness in hiring for all people, including those who have health conditions. "Congenital Heart Defects." National Heart, Lung, and Blood Institute. 1 July 2011. Were you or a relative diagnosed with a congenital heart defect? What type was/is it? What were your symptoms associated with a congenital heart defect? What kinds of treatment, including surgery, did you receive for a congenital heart defect? Are genetic disorders or smoking suspected to have caused your congenital heart defect? Cardiac Catheterization is an invasive imaging procedure used to evaluate patients at risk of or suffering from heart disease. Other interventional or therapeutic procedures may be performed during cardiac catheterization. Cardiac catheterization in general is a safe procedure; however, examples of risks include: blood clots, abnormal heart rhythms, infection, stroke, or heart attack. The results of the procedure will determine follow-up treatment or procedures.